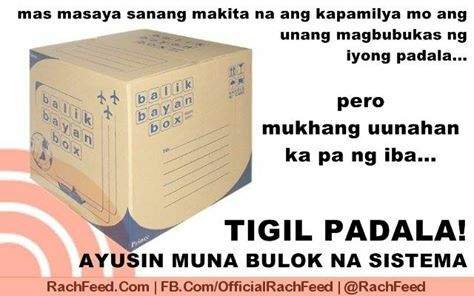 In the past days, the undeniable posts from a lot of my Facebook friends is about their fury towards the Bureau of Customs’ implementation of the rule regarding random inspection of Balikbayan Boxes being sent by Overseas Filipino Workers (OFWs). With the abundant and amplified posts of people on social media about their resentment regarding this ruling, it can simply be deduced that this new ruling is one hell of an epic fail of a move from BOC. This failure is so imminent and forthcoming because people from Bureau of Customs are simply not the type of people to be trusted. They actually have quite built such a despicable reputation for themselves. Because of the protracted history of corruption, pilferage and embezzlement in the bureau of customs, people working in this bureau are simply the last souls in the planet to be trusted by the overseas Filipino workers. What is so utterly dense about this decision is that the bureau’s main aim is to catch big illegal smugglers out from the regular people’s parcels and packages. When in fact, big time smugglers can actually enter their illegal goods in mall-sized amounts via cargo ships. BOC people can’t seem to see the freaking cargo ship in front of them – containing fake rice, household trash from Canada, high-end luxury cars from Europe, oil and fuel from Middle East and deadly drugs from China — yet they choose to look into the small and meager balikabayan boxes. A conceited Philippine senator even agreed on opening the boxes but suggested that it would have to be under the watch of a CCTV camera. Such proposal though tolerable is still not acceptable because, this means that BOC people would still have to open a private property. The best solution I suppose is for BOC to purchase high tech x-ray and scanning machines similar to the ones found in the airports so that no boxes would have to be opened up. And if they find expensive shoes or pricey designer bags in these boxes, I suppose these items need not be charged with irrational taxes. Bureau of Customs must realize how much sweat and blood has already been shed by the desolate OFW so as to bring joy to their loved ones back home. BOC people should also realize that OFW sending or bringing these high ticket items is the OFWs few possible channels in compensating for the time that was lost on being together with his or her family. I know this because I myself grew up receiving these types of items from my father who worked his butts off in the Middle East during the ‘70s and 80’s. It cannot also be denied that a lot of Facebook posts suggests that OFWs should temporarily cease sending their hard-earned goods to their loved ones until the Bureau of Customs has fixed this unwise and ridiculous ruling. This definitely would create hatred and animosity not only by the OFWs but also their loved ones here in the country not only towards BOC but throughout the present administration itself. Two words of advice to BOC: Fix It!